Punjab Joint Entrance Test (Punjab JET 2017) is the polytechnic admission procedure organized for the candidates of Punjab state. It is Punjab JET is administered by the Punjab State Board of Technical Education & Industrial Training, Chandigarh (PSBTE & IT). It is the state level admission process through which candidates can pursue diploma courses from more than 130 polytechnic institutes situated across the Punjab state. The candidates should possess the Indian citizenship. The candidates should have passed or appearing in the 10th examination with mathematics, science and English from the recognized educational board in India. They should have minimum 35% in PCB or PCM and English to appear for the examination. The candidates appearing for the 10th exam are also eligible to apply on a provisional basis. The candidates can avail the application form online or can also be collected from prescribed branches of PNBs, deputy commissioner’s office, schools, polytechnics, district education offices and board offices. The cost of the application form will be Rs.50/-. Online Application Form along with the demand draft through Registered /Speed Post at the Office of the Board. Candidates must paste a recent photograph on the printed application form in the space provided for same. Do not staple or pin this photograph. Photograph need not be attested. Also this printed application form should be signed by candidate and Father/ Guardian of the candidate. There is the provision of negative marking. 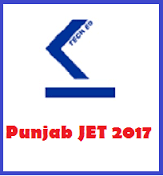 The JET 2017 is a multiple choice type examination consists of 200 objective type questions of total 200 marks based upon the syllabus of 10th class of Punjab Board. The examination is about 3 hours. The syllabus of JET 2017 will be based on the 9th and the 10th standard syllabus prescribed by the Punjab Board of Schooling Education. The JET 2017 will be consisted of four main subjects as mathematics, English, physics, chemistry and mental ability. To qualify the test and make eligible for the counselling, the general candidates must have to score the minimum of 10% of the total marks, beside the SC/ ST and OBC candidates must have to score the 5% marks of the total marks. As per the latest information given by the board about the Punjab JET Exam that the examination will not be organized for year 2016 and the admission will be done on the basis of marks got by the candidates in their qualifying examination. The admission will be done on inter-se-merit base. So there is no need to any admit card any more. Due to not commencing the entrance examination, the merit list will be considered as the result for admission. As the admission will be done on the basis of merit that will be prepared by the score of candidates in 10th (quantifying exam).Candidates seeking for the diploma courses from the colleges of Punjab state (previously appear through Punjab JET) will get the admission on the basis of merit of qualifying examination. The merit list will be published on the official website of the examination conducting authority. The board will announce the Punjab JET counselling 2017 in the month of June. The candidates who have scored marks more than the cut-off marks will be eligible to sit in the counselling procedure. Online counselling will be scheduled for the candidates for providing admission. Physical appearance of the candidates is not required at the time of counselling. Candidates can exercise their choices for college/trade at the time of counselling. There will be two rounds of centralized counselling. The vacant seats shall be filled through direct admission. The admission to the diploma courses will be followed by the online counselling conducted by the Punjab State Board of Technical Education & Industrial Training, Chandigarh. The seats are allotted on the basis of merit of qualifying examination. 85% seats are reserved for the resident candidates of Punjab state and 15% seats are open for the all India candidates.